... Expert mode, Pyro-Turbo, a Soft Close door and more...the sophisticated nature of this Pyrolytic Multifunction Plus Induction cooker is testimony in itself to the full extent of De Dietrich’s culinary expertise. A cooking range is a kitchen appliance which typically has four burners and an oven. Restaurant-style models often have extra burners, a griddle and/or two ovens. It may be gas, electric or a combination. On ArchiExpo, these items are categorized by properties including fuel type and function. These appliances combine different cooking options in a single, compact unit. This saves space and facilitates installation. 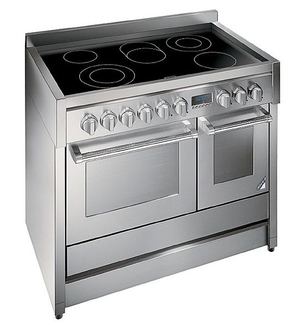 While those who cook infrequently or have limited space may prefer a small range, a large model is ideal for preparing significant quantities of food and cooking different dishes at the same time. In professional kitchens, the cooking range may be subject to special hygiene and safety regulations. Consider choice of power source. While gas is often less expensive and offers more precise heat control, it is also considered less safe and may complicate cleaning. Determine installation modality. Most ranges are freestanding with the cooking surface at the same height as a standard kitchen worktop. Other factors include quantity and type of food to be prepared, and required cooking time. A convection oven circulates the air within, resulting in faster, more even cooking.